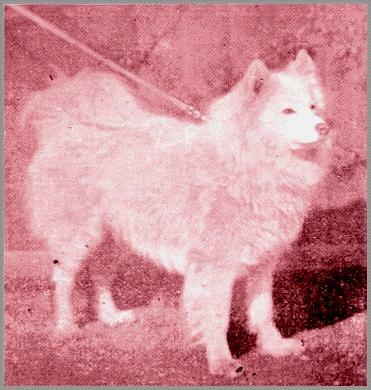 TASTES that develop into enthusiasm are often hereditary, and it was from her father, one of the first and one of the 'staunchest admirers of Samoyeds, that Mrs. Thynne inherited her passionate devotion to the beautiful sledge-dogs. For many years past her exhibits have been one of the leading features of Samoyed classes, and where their charming character and magnificent power have won them unanimous praise and the highest honours. One of the best of her earlier exhibits was Karawitch, the Crystal Palace sensation of 1912, and who died just at the opening of what promised to be a wonderful career. His loss was written-off, and his place filled, however, when Ch. Viking came out to conquer and to take his full championship in a short time.